Had your fill with bad news? Thoroughly disgusted with the caliber of our “leadership”? (hint:“Evolution is a theory out there”, “Global warming is a hoax perpetrated by scientists to fatten their grant income”). Well, here is a powerful antidote. Hemophilia B, the disease that changed history (and not for the better). Hemophilia is a disease of failure of blood clotting, and failure to clot can be fatal. Rabbi Judah said in the Babylonian Talmud (second century) that if a mother had two consecutive babies who died of bleeding after circumcision she should not have subsequent newborns circumcised. Obviously, the good Rabbi knew nothing about genes; but he was wise enough to recognize that something was transmitted to the male babies that did not allow them to clot normally. Fast forward to the 19th century. Queen Victoria of the United Kingdom bequeathed an unwelcome trait to her male progeny –hemophilia. Because political marriages, an instrument of diplomacy since antiquity, were still practiced in the 19th century, this gene was passed on to male royals in Britain, Russia, Spain and Germany. Most of affected males were inconsequential in terms of history. But one, the Russian Tsarevich (Prince) Alexei Nikolaevich, son of Tsar Nicolay II, had a profound effect on the course of history in the 20thcentury. His mother, the Empress Alexandra, was so mortified by the prospect of her son bleeding to death that she resorted to prayer and occult practices. That’s how a mysterious hermit monk, Grigori Rasputin, gained access to the palace, and treated the boy with spells and potions. The Tsar himself was skeptical of Rasputin. He was actually quite enlightened and hopelessly intellectual, and was trying to institute liberal reforms despite the opposition of the aristocracy. 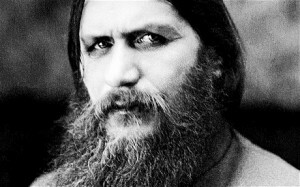 The scheming Rasputin had bigger ambitions than curing an afflicted young prince. He gained controlling influence in the inner circles of the Tsar and used it to counteract the weak Tsar’s wishes with his own reactionary policies to exploit and oppress the peasantry. He eventually was murdered in the best Russian tradition, but it was too late: the masses rose up, the Revolution began, and the house of Romanov was murdered in cold blood, on a direct order from Lenin. 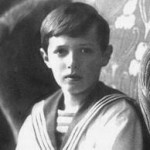 Much of the ensuing suffering of the tortured past century can thus be traced to the young Tsarevich’s Hemophilia B. Think about it. Coagulation is effected by a cascade of proteins (called factors), each activating the next in line, eventually activating the enzyme thrombin, which in turn converts a plasma protein called fibrinogen into fibrin. Fibrin forms the solid clot that stops the bleeding. Coagulation cascade; note Factor IX, top right. The most common forms of hemophilia are called hemophilia A, which is due to a mutation of factor VIII, and Hemophilia B, which is due to a mutation of factor IX. Today, both hemophilias are treated with plasma concentrates of factor VIII and IX, respectively. This is an expensive proposition; In the United States and other developed countries, annual costs for a single adult patient of clotting factors for hemophilia are approximately $150,000 for on-demand therapy and $300,000 for prophylaxis, which could incur a lifetime cost of over $20 million. Multiply that by the 30,000 individuals in the U.S. who have the disease, and you get an idea of the cost to the country. Several attempts were made to treat hemophilia B with gene therapy. The approach was to load the normal Factor IX gene onto a non-pathogenic virus called adeno-associated virus (AAV) and inject it intravenously. The virus then invades liver cells, sheds its protein coat, unloads the Factor IX gene, which then starts cranking out the normal version of the coagulation factor. A previous trial used AAV2 (serotype 2). The patient’s liver cells that received the virus (transduced cells) started making some Factor IX, but the effect was short-lived; the immune response recognized the virus and the cells that harbored it as foreign, and destroyed them. Tthis is where matters lay until a new assault was mounted: a different virus serotype (AAV8) was used, and the patients were pre-treated with prednisolone, an immunosuppressant. This time the patients started producing normal factor IX, which at 6 months was still physiologically active. In monkey studies it was shown that the gene was effective even after 10 years. entered the liver cells and shed their protein coats faster than the previous serotype (AAV2). Why is it important? Because the immune response recognizes invaders, including viruses, via their protein. Once the protein coat is shed, the cell proceeds to digest it beyond recognition, so to speak, and the immune cells are thus outmaneuvered. The AAV8 virus may have also entered the liver cells faster, avoiding exposure to roving immune cells on the lookout for foreign invaders. To make sure that immunity is not roused prematurely to abort the virus sneak attack, a dollop of an immunosuppressive drug is added. Why is this experiment a landmark? Because it opens the way to other genetic therapies, of other diseases, where one gene is identified as the culprit. And what is remarkable about it is that it didn’t take a major scientific breakthrough, no new technology, no new discovery, only minor adjustments such as tweaking the virus type and pre-treating with predinisolone. In case you wonder what’s the cost of such a treatment? $30,000. Compare it with the exorbitant costs of today’s treatment of hemophilia. Hemophilia B is also called “Christmas disease”, after the patient in whom the disease was first described, in 1952 (10 year old Stephen Christmas). I couldn’t think of a nicer Christmas present from the medical community to the world. Dov Michaeli MD PhD is a basic researcher who writes at The Doctor Weighs In.